It is no secret that I love printed body con. This dress obviously ticks all the boxes for me. Skin tight, shows every curve and has a fab print on it. This particular one is by AX Paris and was given to me courtesy of Simply Be. Now, the only grumble I have with this dress is the fact that I just don't get on with AX Paris sizing! I am never, ever my usual size and always have to size up. Keep that in mind if you fancy purchasing this dress. Sizing issues aside I love the thick fabric this dress is made of. I like to feel secure and to appear all smooth when I wear a body con and I find thick fabric helps achieve this look. It's quite a short dress but paired with thick tights I really don't have a problem with getting my pins out. I didn't realise until I saw my behind that the print placement is off ... but I actually don't mind having a different print on each cheek! I've not worn these shoes in a while but thought the navy and white laces would go perfectly with the jewel tones in the print. I bought them in H&M last year. The ombre fury stole is from River Island and I actually bought it for my Mum for Christmas it's so beautiful! I kind of wish I'd bought myself one, or maybe I'll just have to steal it for when I move back to London. My lippy is 'Heartbreaker' by Sleek Makeup and the pinky coral colour is lovely and bright and their lippies are really nice and pigmented. I think this is such a good outfit for a night out or a date ... now all I need is for someone gorgeous to take me out! Love!! You are gorgeous! 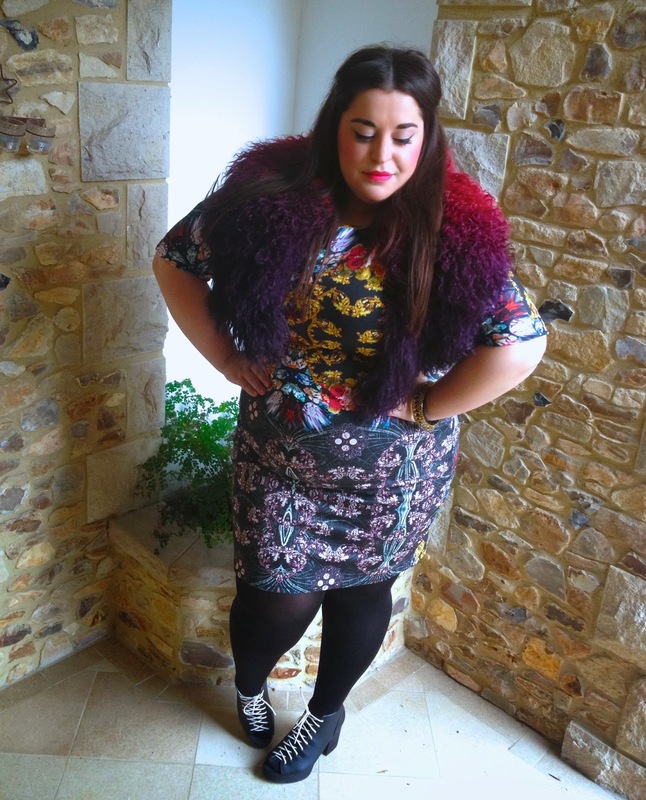 I having sizing problems with all of simplybe's items, which is such a shame. I'd take you out. BOOM! FAB!! And the furry stole is so fun! I love the way you've styled it. I was just about to say I love the print placement then I saw the back photo...kinda wish it wasn't like that, although the placement on the front is perfect. Guh! I LOVE this look so much! Stop press. I'm wearing jeans. My nod to the 90s. Pretty much the softest jumper you'll ever feel. Can we talk about my muff please? 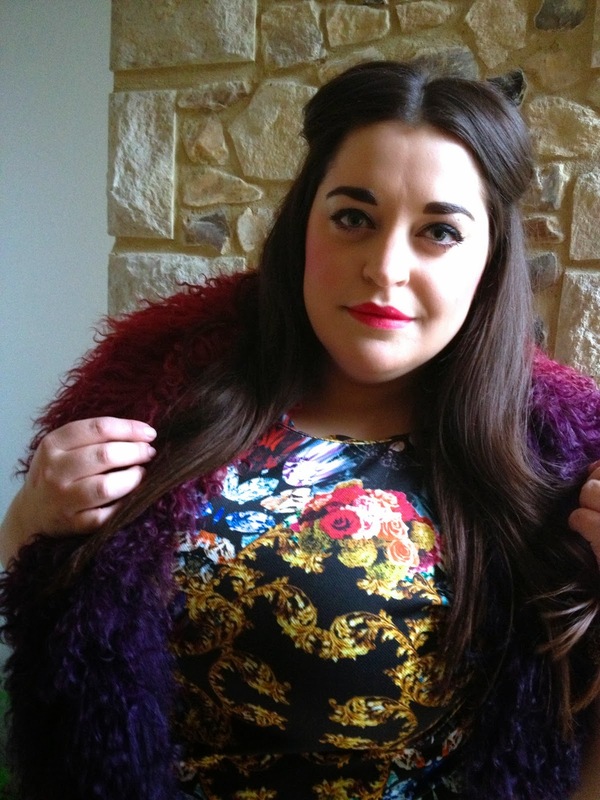 A day with Topsy Curvy.